The Sensorial Scope and Sequence is designed to help children focus their attention more carefully on the physical world, exploring with each of their senses the subtle variations in the properties of objects. Through experiences with sensorial lessons and materials, children refine the use of their senses. These experiences help children to pay attention, to focus their awareness, and to learn how to observe and consider what comes into their experience. With these goals in mind, the sequence of lessons and materials is important. 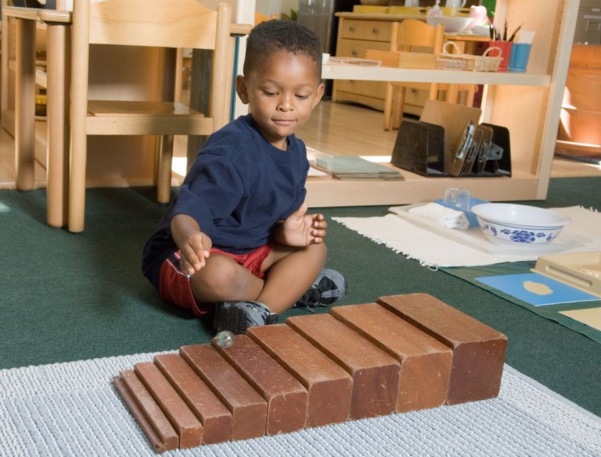 All of the content for Sensorial is divided into sub-categories that contain lessons sequenced in the order in which they would be introduced for most children in many Montessori classrooms. The Sensorial Scope and Sequence is displayed in the following “online magazine” format. Lessons/Materials are listed on the spreadsheet, sequenced the same as they are in the Montessori Compass online record keeping software. Each lesson/material may contain multiple elements, which are tagged to the appropriate cycle year(s). In some cases, parent-friendly descriptions will be listed, designed to help parents gain greater insight into the Montessori classroom.